The MQ-1 Predator isa medium-altitude, long-endurance, remotely piloted aircraft. TheMQ-1's primary mission is interdiction and conducting armedreconnaissance against critical, perishable targets. When the MQ-1 isnot actively pursuing its primary mission, it acts as the Joint ForcesAir Component Commander-owned theater asset for reconnaissance,surveillance and target acquisition in support of the Joint Forcescommander. The MQ-1 Predator isa system, not just an aircraft. A fully operational system consists offour aircraft (with sensors), a ground control station, a PredatorPrimary Satellite Link, and approximately 55 personnel for deployed24-hour operations. The basic crew for the Predator is onepilot and two sensor operators. They fly the aircraft from inside theground control station via a C-Band line-of-sight data link or aKu-Band satellite data link for beyond line-of-sight flight. Theaircraft is equipped with a color nose camera (generally used by thepilot for flight control), a day variable-aperture TV camera, avariable-aperture infrared camera (for low light/night), and asynthetic aperture radar for looking through smoke, clouds or haze. Thecameras produce full motion video while the SAR produces still frameradar images. The MQ-1 Predator carries the Multi-spectralTargeting System with inherent AGM-114 Hellfire missile targetingcapability and integrates electro-optical, infrared, laser designatorand laser illuminator into a single sensor package. The aircraft canemploy two laser-guided Hellfire anti-tank missiles with the MTS ball. Thesystem is composed of four major components which can be deployed forworldwide operations. The Predator aircraft can be disassembled andloaded into a "coffin." The ground control system is transportable in aC-130 (or larger) transport aircraft. The Predator can operate on a5,000 by 75 feet (1,524 meters by 23 meters), hard surface runway withclear line-of-sight. The ground data terminal antenna providesline-of-sight communications for takeoff and landing. The PPSL providesover-the-horizon communications for the aircraft. An alternatemethod of employment, Remote Split Operations, employs a smallerversion of the GCS called the Launch and Recovery GCS. The LRGCSconducts takeoff and landing operations at the forward deployedlocation while the CONUS based GCS conducts the mission via extendedcommunications links. The aircraft includes an ARC-210 radio,an APX-100 IFF/SIF with Mode 4, an upgraded turbo-charged engine andglycol-weeping �wet wings� for ice mitigation. The latest upgradeincludes fuel injection, longer wings, dual alternators and otherimprovements. The "M" is theDepartment of Defense designation for multi-role and "Q" means unmannedaircraft system. The "1" refers to the aircraft being the first of aseries of purpose-built remotely piloted aircraft systems. ThePredator system was designed in response to a Department of Defenserequirement to provide persistent intelligence, surveillance andreconnaissance information to the warfighter. In April 1996,the secretary of defense selected the U.S. Air Force as the operatingservice for the RQ-1 Predator system. 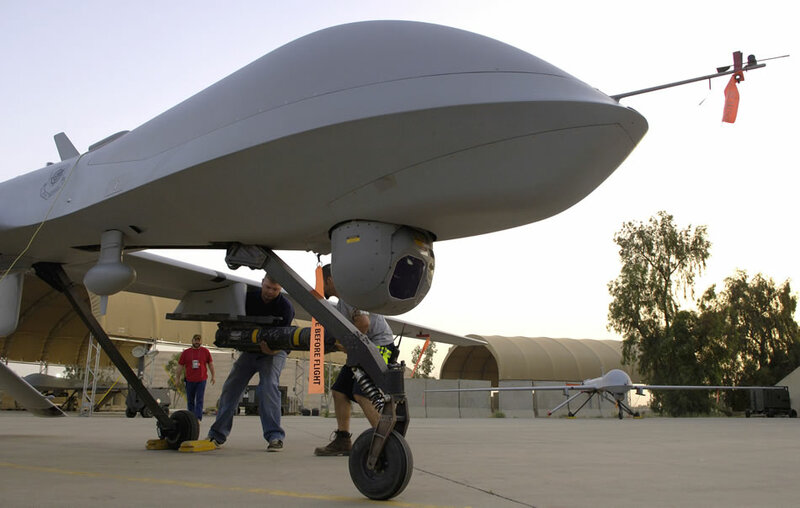 A change in designation from"RQ-1" to "MQ-1" occurred in 2002 with the addition of the armedreconnaissance role. Operational squadrons are the 11th, 15th and 17th Reconnaissance Squadrons, Indian Springs Air Force Auxiliary Field, Nev.